Yesterday I had what was definitely my best snowkiting session this year after I'd thought the snowkiting season was long over. I drove for 2.5h through the snow to get to Diamond Community Park in Akron, OH. Unfortunately, this is one of the closest spots I have for snowkiting, but it's an excellent as far as inland spots get. It's a 1000' x 1000' public park with only one tiny obstruction in the middle and a couple of baseball fields at the edges. Everything else is just nice, mowed grass so you can get some nice runs in no matter where the wind is blowing. Previously at this spot I've seen some very shifty and gusty winds, so my first instinct was to get out my new Peak 2s. However, when I actually got out of the car the winds seemed steady enough so I took out my 8m Speed 4 and it was perfect. Light enough that it stayed up through the lulls, fun to fly, but it never scared me in any of the gusts. The wind was unmistakably inland with gusts, lulls, and several attempts to bowtie my kite. However, I was always able to get the kite sorted out at the bar and never left my bindings for the ~2.5h I was there. The wind was a little light for the 8m and a 10m or even 12m probably would have been magical, but I had enough power and it was a good chance to work on my technique. I did more downloops that session than I have in all the rest of my kiting and I continue to be amazed at how consistently the lines stay tensioned through the loop even when the wind is marginal. When I was riding along and a gust hit the acceleration was amazing and definitely made it worth the 5h of driving this session cost me. However, while the gusts were fun, the lulls were shockingly abrupt. I'd be riding upwind well powered when suddenly all the force would leave the kite and I'd instantly go over backwards since the pull I was leaning against vanished. I'm not sure if I'm just leaning back too much, or if this is just a fact of life when kiting in these kinds of winds. Regardless, this was definitely my best session of the year and if I didn't have other things to do that day I would have easily been out for at least twice as long. Huh, I would think gusting into the 30s would be comfortable on your 5m Apex. Yesterday the forecast included gusts in the mid-30s so I wasn't sure if the 8m Speed 4 would be too much, but it certainly wasn't. I don't have a weather station right nearby though, so I'm never really sure what the actual windspeed is. I'm really glad my snowkiting brothers have been getting in some good late-season sessions! 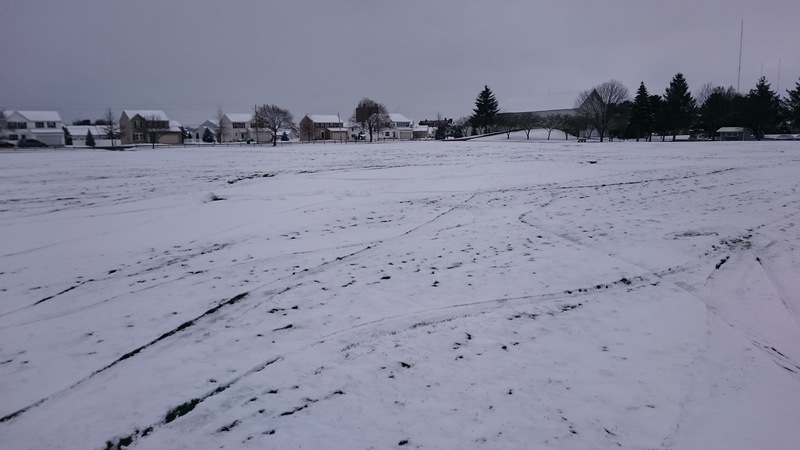 While I just telemarked at our local ski resort today on Closing Day, the fields I use for Snowkiting haven't had snow on them for more than a month now. Winter in my home town came in with a roar but went out with a wimper. I get how 30+ can be intimidating. Those are strong winds and I get puckered up with those too. My best weapon in that setting now is a 6m Access, but I'd rather have the 4m for those winds. I could also use my 4m Peak2 but honestly it probably pulls harder than my 6m Access and is a lot harder to wrestle to the ground. Nice shots of the speed 4. Thyre really nice kites. Any video of the action. 30mph is close to the 8m limit but definately doable on snow. Wish we had more snow this year but unfortunately that's it for us. I decidedly didn't feel at my limit with the 8m then, but it's very possible the winds were less than what the weather station saw. I normally think about sizing down when the kite starts threatening to loft me in the gusts. I don't have any video primarily because I've yet to do anything worth recording :p I've gota pre-order for the new SOLOSHOT teaching tripod and the goal is to be landing jumps and backrolls by the time it arrives. I suspect the 5m apex would've been fine, especially in the snow. I haven't actually used any of the kites off the lake yet, and the conditions this year were pure ice, thin hardpack snow over ice, or at most 2in of snow over ice. In deeper snow on land I'm guessing there is a lot more friction and also cushion for falling Probably the most intimidating part of it for me is solo landing a kite in those winds. I know people do it all the time, I'd just prefer to have a person standing by as backup the first time. Tomorrow is looking like 5-10mph and I'm hoping to get a chance to go one last time. I'd really like to try out the 19m speed 3. Ah, makes sense. I've been getting better at my solo launches and landings, but they could still use some work. 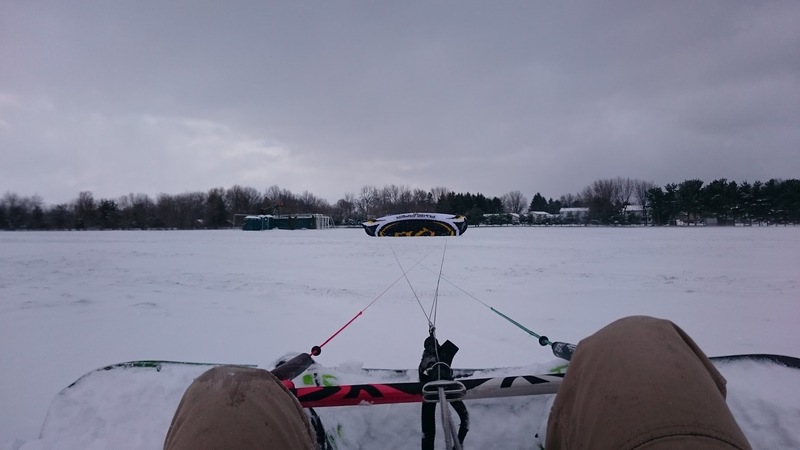 This time i used my snowboard to weigh down one end of the kite, launched, then struggled to put my snowboard on while flying out. In retrospect i should have just landed it upside down like in the picture, put my board on, then reverse launched. Oh well, each time I get out everything is a bit smoother. When the time feels right to consider expanding your Snowkiting quiver I'd give a serious gander at the Ozone kites in their most modern configuration. I'm talking Access, Frenzy, and Summit. These kites have something called the "Re-Ride" system. In a nut shell, what this is is the 5th safety line passes INSIDE the kite to an internal bridling system. When activated (partially by just pulling the 5th line through the chicken loop or fully by releasing the chicken loop during flight) the kite crumples up sort of like an accordion to resemble a wadded up piece of paper. It will drop out of the sky and just sit on the snow without pull even in strong wind. Safest , easiest, and fasted solo landings in the book. They don't come cheap but man are they ever sweet! Yeah, I've seen the re-ride system in action and I am jealous, but the price (plus having just picked up a pair of Peak 2s recently) means I won't be getting one any time soon. I'd love to see more manufacturers going in that direction (or just more used Ozone kites coming up for sale). I hear ya. The 6 and 9m P2s make for fine Snowkite engines. I've put brake line cross straps on all of my Peaks and use them to take them out of the sky. I find that helps a bit. I'm with you though, controlling a kite solo in these sorts of conditions is a BIG challenge for me too. One way to try and pin a Peak 2 to the ground is to pull the clam cleat rope in all the way, put the kite on the ground nose first and then let out the bar. I've had mixed success with this can work. Good luck!